The Federal Occupational Safety and Health Administration (OSHA) requires that employers who provide fire extinguishers in the workplace must train employees on how to use them. To meet this requirement Keane Fire & Safety offers on-site fire extinguisher safety classes to its customers. The training begins with a 15-minute DVD which explains fire prevention, evacuation, the classes of fires, and the basic operation of a fire extinguisher. After the presentation, we review the types of fire extinguishers on site and the organization’s policy and procedures. 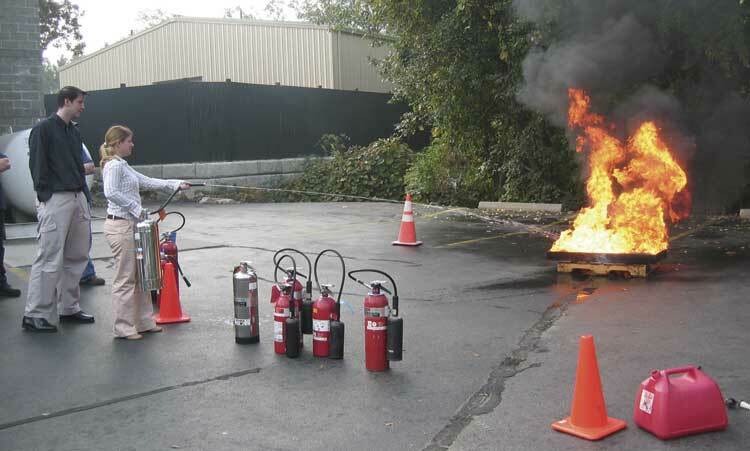 Finally, to familiarize people with how to put out a fire we encourage participants to operate a CO2 fire extinguisher. (The CO2 fire extinguisher is a clean agent and will not leave any residue). This allows us to conduct the training inside or outside. Each session can accommodate a maximum of 25 people and lasts approximately 45 minutes to an hour. Upon completion of the session, a training certificate is sent for your OSHA files. Keane Fire & Safety also offers live fire training at our customer’s place of business. Keane will follow-up with the local fire department for approval before the training. Customers are responsible for disposal of the hazardous waste since we are not allowed to remove it from the site. Please email or call for pricing.